This is the perfect recipe for ice cream fans - it’s luxuriously creamy, sweet and so easy to make at home. Eat a generous helping for pudding or have a couple scoops alongside another treat. We recommend eating your homemade ice cream within two weeks of making it – if you can wait that long. Heat the brown sugar in a small saucepan over a medium-high heat. Stir the sugar until it turns to a dark amber colour. Add the cream and stir until small bubbles appear around the edge of the saucepan. Take the saucepan off the heat and stir in the salt and vanilla extract. Set the caramel sauce to one side and leave to cool. Whisk the egg yolks in a medium-sized heatproof mixing bowl until smooth. Gradually whisk in the sugar until the mixture thickens and changes to a pale yellow colour. Combine the milk and cream in a medium-sized saucepan over a medium flame. Stir occasionally. Use a thermometer to check when the milk mixture reaches 75°C. Take the saucepan off the heat. Now you need to temper the eggs to make sure the eggs don’t cook when combined with the hot milk mixture - pour a splash of the milk into the yolk mixture and whisk rapidly. Then pour the egg yolks into the milk mixture and return to a low-medium heat. Gently cook, stirring frequently, until the texture thickens. Use your thermometer again to check when the temperature reaches 85°C. Remove the custard base from the heat and leave to cool for 5 minutes. Then mix in the caramel sauce. 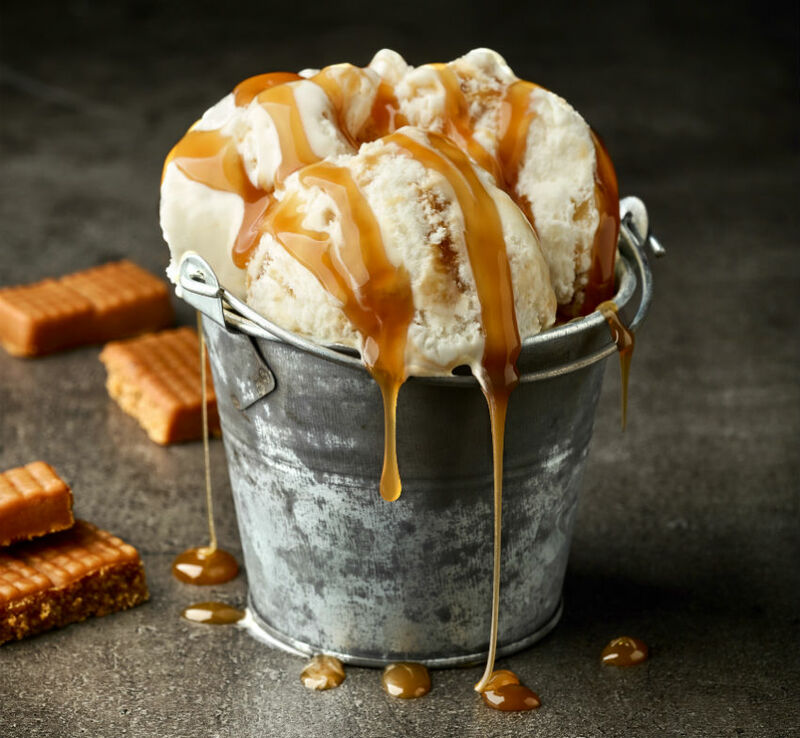 Pour the caramel-cream base into a clean heatproof bowl and place it in a bigger bowl that’s one third full of iced water. This will cool down the mixture ready for churning. It’ll take around 20 minutes for your mixture to cool – make sure you stir it occasionally to stop a skin forming. Cover the caramel-cream base and chill in the fridges until it’s completely cold. Pour the chilled ice cream base into your Buffalo Ice Cream Machine and set the timer for 30 minutes. If you prefer firmer ice cream you’ll need to leave the machine churning for longer.